Offering a free and a paid version of your app is a great way to build trust and grow your audience. However, it can be challenging to convince some users to pay for a subscription. Convince those users of the value of your subscriber-only features and they’ll be more likely to buy. Try guiding users through your paid features with an onboarding campaign, or start a free trial to prove the value of a subscription. Guide users into your paid subscription. An onboarding campaign can explain the value of your app and all it’s features. Users who understand why they should subscribe are much more likely to pay. Trigger automated in-app messages at key moments to encourage users to subscribe for your paid version. For example, if you want to convince users to subscribe to an ad-free subscription, trigger the in-app message immediately before or after an ad. Increase paid subscription signups with a free trial. Make it easy for users to experience the paid version of your app with an automated variable change. 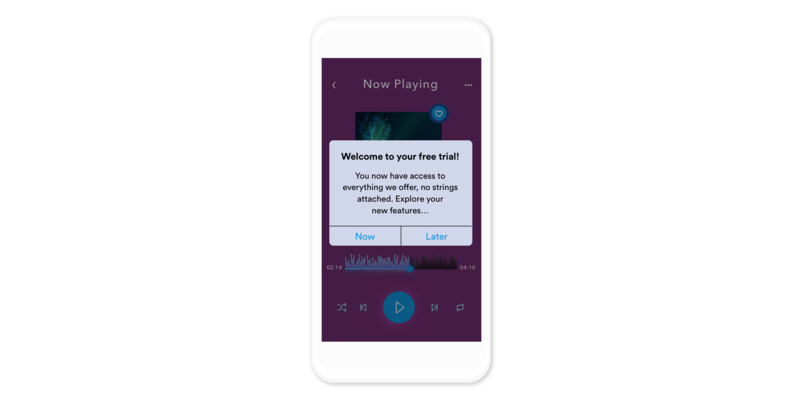 With Leanplum, you can trigger a message asking users if they want to start a free trial of your subscription — no strings attached. Users who agree to the trial will start the paid app experience on their next session. After a week, you can trigger another message asking users if they’d like to continue their subscription. Selecting “yes” will lead users to sign-up for the paid option, and “no” will return the app to the free version at the user’s next session.